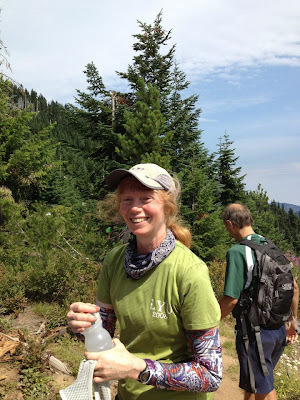 I would like to start this blog with Kathy Vaughan, the highlight of the weekend for me. 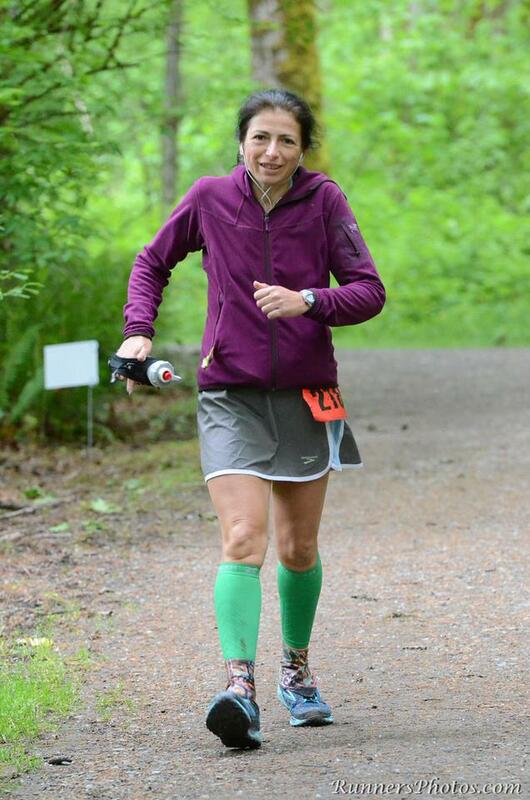 She worked hard to get under the 32 hour cutoff and had doubts of finishing when she completed her 8th loop. She thought for sure she could not complete 2 more loops in the time she had left because she felt she was getting slower and slower and reported she was hurting more and more. Tears showed her frustration. But she was the only one who felt she could not finish. Everyone else who had run with her and helped her along knew she could do it. Pacers Tonya Hoffman and Angel Mathis were paricularly key, encouraging her throughout the race. Both were there when she finished. Ras was loving as usual. Her words at the end summed the experience all up for her. 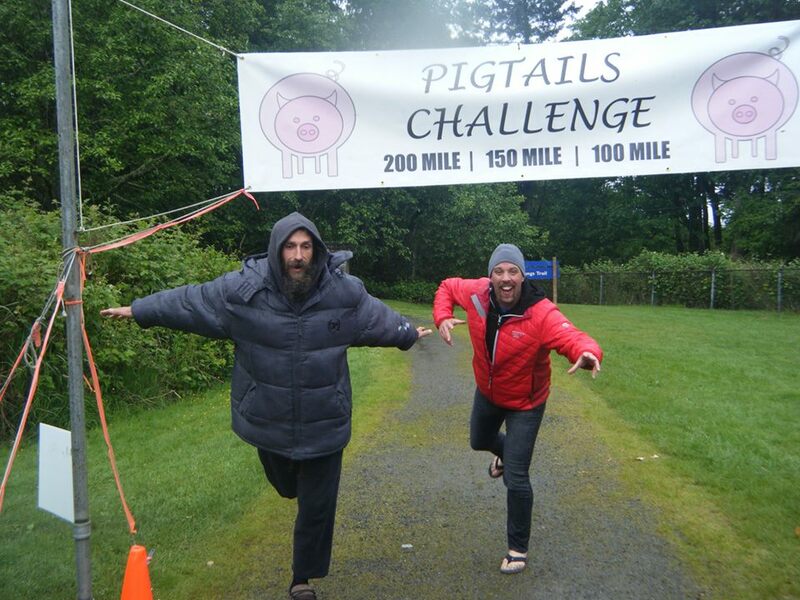 It went something like this: "I can't believe you runners do this 100 mile thing. It hurt the whole time!" Welcome to the 100 mile club Kathy! Prior to the race a few months back, I had announced that I would not put on this race again and opened it up to any takers. After this year's event, it became clear that this race is too special to end, according my running partner Deby Kumasaka. So, as they say in Hollywood, the show must go on. My plan for next year is to gather a group of people who have expressed interest in taking it over, orgainize it as a joint effort, and then hand it off the following year. 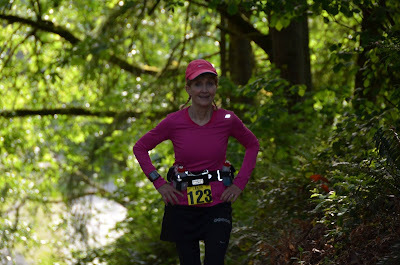 Vicki Griffiths will be 70 next year and Barb Macklow will be 80, and Vicki expressed to me that they want to do my race with those milestones. How can I deny them of the opportunity? So I will put it on one more time doing a better job of delegating because as you will, it is a lot of work! As most people know, I work 50-60 hours a week as a physician assistant in orthopedic surgery. With the long days starting out with rounds at the hospital and the frequent call I have to take, it leaves me little time for much else. In fact, if I am lucky, I can run 1 or 2 days a week and not much more than 30 miles unless I'm racing. So I try to fit in time here and there to deal with the race, such as answering all the emails and special requests, dealing with permits and insurance, ordering supplies, shopping for food, getting port-a-potties, meeting with unhappy residents near the trail, etc. The list goes on and on. The only thing I delegated this year was getting volunteers, and Jess Mullen was the perfect person for that. She knows a lot of people and can do the job enthusiatically. The volunteers were spectacular this year. Thanks everyone for all your hard work. I used up three of my vacation days this year for the race. Fortunately, the Monday following is a holiday and I have Tuesdays off. This allowed for clean up post race. On Tuesday before the race, I purchased the rest of the food needed (the perishables). All other food had been purchased the previous week. I completed stuffing the goody bags with bib numbers and I finished the big white boards with all the runner's names and splits columns. I also met with the Park Ranger to try to talk to the angry neighbor but he was not home. The day before the race I boiled and cut up potatoes, picked up wth U-Haul truck and spent the rest of the day loading all the supplies. I had to also meet the port-a-potty guy to show him where the middle aid station was located. Next year, I will place 2 there since it got used a lot and kinda got gross. I also marked the 200 mile out and back turn around. Before I knew it, it was Wednesday night and time to head to bed to get as much rest as possible before what I knew would be a long weekend of managing whatever came my way. Ken got up with me at 3:30am on Thursday morning and we headed to the race headquarters at 5am, which was also the start/finish of each loop. I was definitely worried when I had to set my windsheild wipers on steady instead of intermittent. It was raining as we tried to get all the shelters up. Fortunately, we had a lot of help from runners and crew to get things up quickly. Also, check in was quick since there were only nine 200 milers and one 100 miler (Jeff Rankin who had to work on the weekend). Gavin Woody had signed up for the 200 but had to drop down to the 150 because of work. 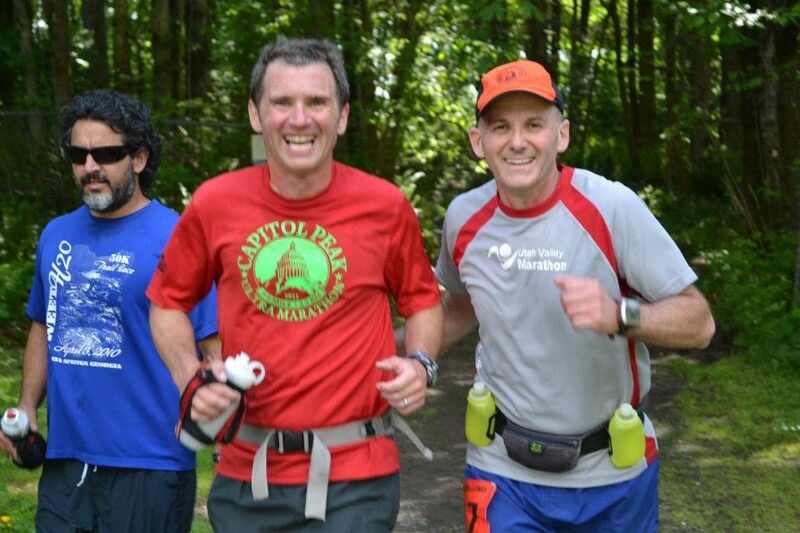 It was great to see Tony Covarrubias again, down from Alaska to attempt the 200 miler for his 200th ultra. 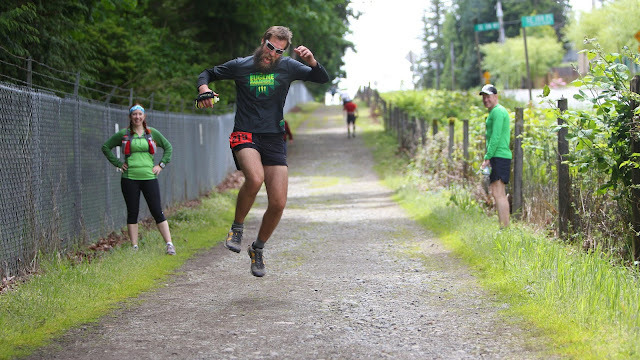 Tony was a fixture here in the Pacific Northwest ultrarunning scene but moved away a few years ago. Ed Hanson came from Florida and was covered from head to toe the entire race. He never warmed up like the other runners. Ken Michal was back to repeat the 200. He looked nice and trimmed, having lost quite a bit of weight. Ras Jason Vaughan also was repeating the 200. He was fresh off his Sextuple Rim to Rim unsupported OKT (Only Known Time) and Sun Mountain 50 mile. 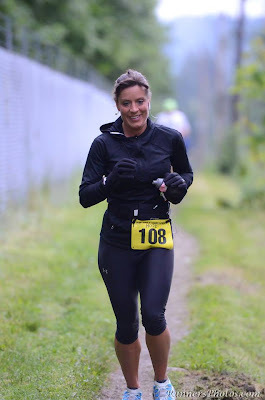 Francesca Carmichael ran the 150 mile last year and had so much fun she decided to go for the 200. Daniel Kuhlmann comes from a big family of runners and needed to hold up his end. His sister Kim Kuhlmann won the women's 100 last year and his father Mike completed the 100 as well. Mike came back this year to attempt the 150, registering under the alias of Buster Spade so that he would not get a bunch of flack from family and friends. 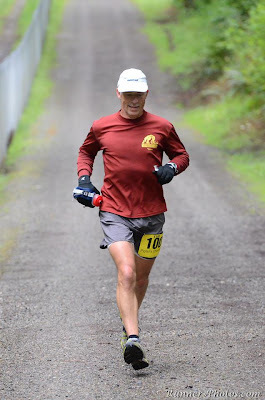 Rob Smith had a long list of running accomplishments including 10 finishes at Cascade Crest but did not have a 200 miler on his resume. It was only appropriate that he attempt it. He is the volunteer coordinator for CCC this year. Jennifer Griste, a veteran 100 miler, came with her San Diego posse to attempt her first 200 as well. 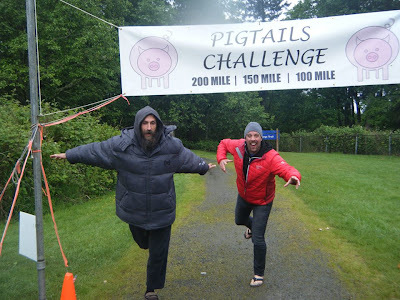 Ray Gruenewald, also a veteran of many ultras, had seen my 200 last year and finally felt ready to take on the challenge. The 200 milers started out in a steady rain. They first needed to complete the out and back (1.3 miles out and 1.3 back) before starting their first odd loop counterclockwise. 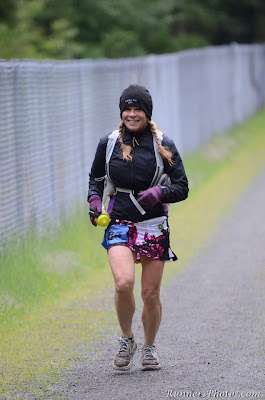 As soon as they took off, my husband Ken and I headed to the middle aid station to set up while George Orozco continued to get the start/finish aid ready. Although there were periods when it did not rain, it was overall a pretty wet day. Early on, the runners were not bothered by it, but I'm sure it took it's toll eventually. The trail was wet and slick in places, and that requires more energy. The middle aid was not manned for the first 2 days for the 200 and 150 milers, but there was water, Gatorade, and small packages of chips, crackers, cookies, and candy. I did not want any food out in the open that little critters could eat. There was a shelter and a chair if a runner needed to stop and sit to fix their shoe or something. Everyone loved having a port-a-potty there, especially the returning runners. I returned every 12 hours to restock the food, water, and toilet paper. I sent Ken home so he could get some work done. He is a furniture maker and works everyday. I let him off the hook this year since he helped co-race direct last year while I ran the 200. I returned to the start and hung out with George as runners came through. We were amazed at the blistering pace that TC and Ken were running and urged them to slow down. They continued this pace for another loop then settled into a more reasonable pace. Danny Kuhlmann just ran steadily, but his dad still felt he was going too fast. Everyone else seemed to feel comfortable with their pace.I fretted every time the rain picked up but the runners never complained. I did visit the angry neighbor and caught him at home. Although he was stand-offish, he thanked me for letting him know that there will be runners at night and they were specifically instructed to be quiet when it became dark. The runners reported a lot of animal activity on the trail such as deer, dogs, and geese. Geese you say? Apparently, there was a family of geese, mom and pop with 5 little goslings. They were quite aggressive because they felt trapped and threatened. Francesca was attacked from behind after she passed them and was bitten on her shoulder blade. Most runners had to stop for a while and figure out how to get around them. The parent geese were hissing at them. TC fell in a ditch trying to give them room as he passed by. 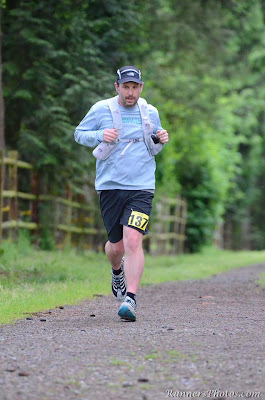 Rob Smith was chased by a dog that was nipping at his heels that he encountered only in the first loop and then did not bother any other runner. I reported it to the park ranger but they were gone by the time he got there. As the runners passed though, we recorded their times, wrote them on the big white boards, and posted them on facebook as often was we could-not enough I'm sure for some family and friends following along. Linda Walter took over for George when he had to leave. She had done the 100 last year and was back to make it a streak. She was generous enough to volunteer on Thursday last year too. Heather Latham came to help out after Linda left. Daniel finally caught Tony after the 8th loop. Jennifer Griste had a very experienced crew helping her. Paul Schmidt was her crew and pacer. He created and directed San Diego for 7 years before handing it over to current RD Scott Mills. He also is a physical therapist, quite handy to have on your crew. He serenaded us with his guitar and had a wonderful voice. I just loved the laid back atmosphere of the race! Randy was crewing and pacing Rob and it was fun takin care of the crew just as much as the runners in those first two days. We had hot dog at 1pm, pizza at 6pm, and grilled cheese sandwiches or quesadillas at 9pm. Also chicken noodle soup or butternut squash was offered at night. We had to have coffee too. Patrick Ackley joined me at night. It was fun hanging out with him and catching up. I took a quick 40 minute nap. Bob Satko came to relieve Pat and I found he had arrived while I was asleep. Pat hung out a little longer as the three of us reminisced about our 200 mile finishes last year. The 150 milers started arriving at 5am to get set up. I walked them out on the course about 1/3 mile and did a quick briefing, warning them about biting geese and staying quiet at night. Geri Ginsburg, a fleet footed 53 year old ultrarunner gave chase on the first 2 guys. She was able to stay close to Jonathan Symmes, who came in 2nd in the 100 last year with a time of 19 hrs but could not keep up with Gavin Woody, who moved very smoothly the entire time. Once again, the first loop was very fast for all the runners, even if it was not a full loop. They settled into their paces after the 2nd loop like the 200 milers did. There were more girls who signed up for the 150 than boys. Barefoot Jon ran in his sandals. 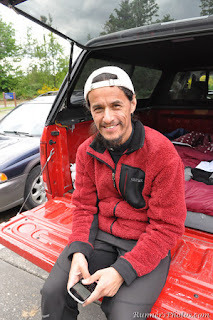 George Orozco came out for the second morning in a row to volunteer. We had another helper too. A senoir in high school needed to perform 20 hours of community work for her semester project. Her teacher, Elizabeth Blankenship had volunteered last year and had so much fun, she suggested it to Charnae Williams. She did a great job keeping loop splits and replenishing the food. The thing that amazed her the most was how happy the runners were while RUNNING of all things! I got a call from Tony Covarrubias on his second day of running in the mid afternoon. He needed to drop and needed me to pick him up on the course. Although he was only 2 miles from the start, he had difficulty even walking and the downhills were the worst. The ligaments in his legs about the knee were very tight and he had trouble extending his knees. I felt really bad for him but he was okay with it. He knew that living up in Alaska and running on snow was not helpful for his training. I was honored that he came back to my race to attempt the 200. He could have dropped down to the 150 or 100 before the start, but that's not like him to do that. By now, Ron Frederick was volunteering. He would be back the next day to crew his wife Jackie, who went on to finish her first 100. After I dropped him TC off, the rest of the runners on the course got completely dumped on. Tony felt good about his decision. He was not moving fast enough to create enough energy and would have gotten cold fast. I grabbed a bunch of large trash bags and headed out on the course in my car to find if anyone was between aid stations and needed some protection. I found Ken Michal and he gladly accepted a bag. He was on an even loop and 2 miles from the start. It looked like he was doing about 20+ minute miles. I also gave him my pizza (I had just picked up the pizza for the night). He was so happy when I left him! Everyone else that I saw before reaching the middle aid station (going clockwise) was doing fine. I hung out at the middle aid long enough to get a report from Ras that Ed Hanson, the guy from Florida, had rolled his ankle bad and was moving slowly in the counterclockwise direction. He figured I could intercept him when the trail hit the road. I went back to the road where I had placed the Shshsh signs and ran towards him but went a long ways without seeing him. I wondered if he went the other way since it was closer to the road. I ran into Rob Smith who had a cell phone and he called me 10 minutes later and told me where Ed was and where I could meet him. I was sure glad he had a phone. I finally found Ed, who was moving very gingerly. His ankle, I can't remember which one, was very swollen. I had brought a pair of hiking poles to help him unload his ankle and my robe, figuring he was getting even colder moving slower. It took us 10 minutes to get to my car, which was about a quarter mile away. By now, the rain had tapered off. I gave him an ice pack once we were in the car and got him back to the start. He spent a lot of time in his car warming up and eventually left to go to his hotel room. I was sad to see his race end that way. I was glad to have Tracey Nguyen managing my aid station while I was gone. She is a veteran volunteer and has two 100 milers under her belt-Javelina and San Diego. That was the hardest rain for Friday. Then it just came and went but nothing as heavy. I had planned on getting some sleep that night but wanted to keep Ariana Davies, my middle of the night volunteer company. We warmed ourselves next to the propane heaters in between feeding the runners and keeping loop splits. Some runners continued through their fatigue. Many decided to catch up on sleep. Arianna and I fed them mostly hot food. I was getting pretty rummy as the 100 milers started checking in. By this point, I had slept only once for 40 minutes since Thursday morning, 51 hours earlier. For the weekend, I had three volunteers for the main aid station and 2 at the middle aid station. I got the main volunteers caught up on timing and food and planned on showing the middle volunteers where to go and what to do. They were all veterans-Teresa Hanson, Zach Spud Wilson, and Lars Larson. My middle aid station volunteers were Clay Fox and Rebecca Seymour. Clay's wife Hope ended up winning the female 100, no doubt with a lot of help from him. The weather was perfect-cool and not raining. After taking care of the 200 and 150 milers one on one, I could see that things were going to become chaotic. I did my race briefing with the same warnings and sent them off. The 150 and 200 milers felt buoyed by their presence. The 100 runners had an out and back (3 miles out and 3 back) before starting their 10 full loops. People were quite bunched up I heard when they came in. I had left to show the middle aid volunteers their post. I spent much of the day buying more supplies for the aid stations since the 100 milers consumed vastly more than the 200 and 150 runners. In particular, they liked the coke. Candy and Gatorade went quickly as well. They did not consume solid food as early on as the 200 and 150. Gels disappeared quickly. The main aid was a bustling station as people from runners, pacers, crew, family, local neighbors, the fire department, and anyone just curious about what was happening stopped by. Allison Moore and husband Owen Connell handled the main aid station well while Kris Kissel manned the middle aid station alone. He kept himself busy defizzing the coke by pouring it back and forth between cups to let the carbonation come out. The Sequel's family got lost on the way but were put to work as soon as they arrived. My volunteers really saved me since I had to drive all over the place for supplies and restocking the middle aid. I had a kitchen person serving hot food like quesadillas, hot dogs, soup, pancakes, and turkey sausages.I had a timer keeping track of the three different watches for each of the distances. Bib numbers were red for the 200, blue for the 150, and yellow for the 100 runners to make them easier to spot. And I had a volunteer just replenishing food and helping the timekeeper make sure we got each runner's splits. I tried to update the boards as frequently as possible. Things were happening fast. By the afternoon, Betsy Rogers, Jane Herzog, and Ray Shaw took over. Betsy was of course in charge of the food. 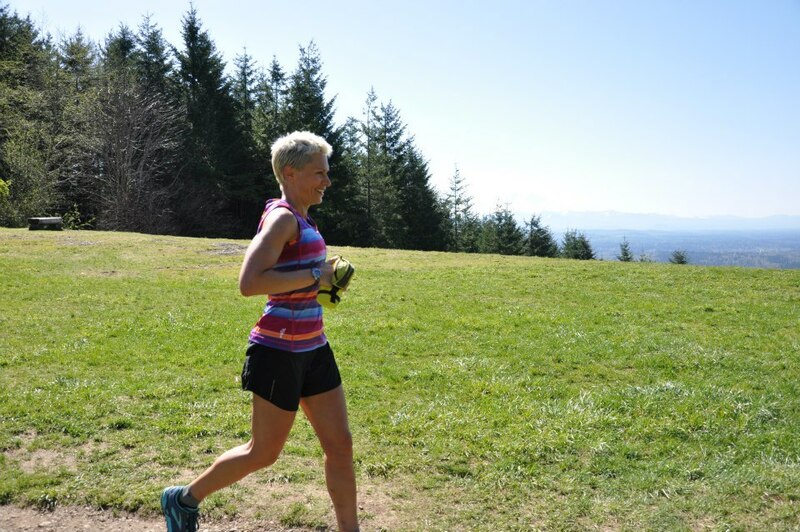 Tracey Brown and Leslie Miller, both longtime runners, were able to help runners at the middle aid with anything they needed. Tim Stroh, the course record holder for the 200 was out of town this year during the week and could not do a repeat. Instead, he decided that the 100 would be a good final run before Bighorn 100 three weeks later. Secretly, he wanted to break 17 hours, and at the age of 50, he said it would probably be his last chance to do so. The weather was very nice for his attempt. At one point about halftway through, he didn't think he could do it. His hamstring was getting really tight. But he sat for a little and it seemed to help I think. He went crazy trying to figure out the splits he needed to complete his task with an expected slowing of pace factored in. He calculated accurately and came sprinting in at 16:58. Way to go Tim! Now he owns the 200 and 100 mile course records. He was able to keep all of his loops under 1:53. This guy is talented! Lee French came in second in his first attempt in the 100 mile with an impressive time of 18:53. He was able to stay ahead of Hope Fox, also running her first 100. She came in 30 seconds after Lee, also in a time of 18:53. Both ran strong the entire time. Unfortunately, I did not get to see them finish. I was falling asleep in my chair and decided I needed to go home and get some sleep. I showered really quickly and laid down for about an hour. I tried to think of everything that needed to be done before I left but in my fatigue, forgot a few things. My trusty volunteers were able to handle things without me. Thank you Monica and Mike Bloom, Maylon Hanold (the cook), Deby Kumasaka and her son Mateo, and Christy Hammond, (middle aid). Monica and Mike pulled a double shift and worked for 10 hours, joined in their second shift by Matthew Abel. I returned only to have missed seeing the insane duel on the 21st and final loop for 200 milers Ken Michal and Ras Jason Vaughan. I had to get eyewitness stories from runners on the course, the middle aid station workers, and spectators at the finish. Ken and Ras were within an hour of each other at 100 miles but neither of them was racing. Or so I thought. They were bringing up the rear until loop 14. 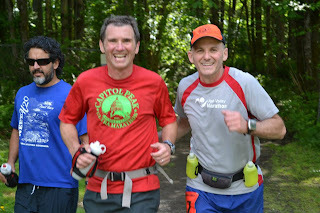 Ras continued to pull away from Ken until the last 3 loops during which time George Orozco was pacing Ken and was able to help him run under 2:30 loops on the 19th and 20th loops. He was able to catch Ras at the end of the 20th loop and both wasted no time getting back out. What's more, they both ran in the dark so that the other runner could not tell where they were. 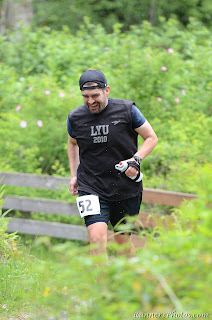 Now, I don't know about you, but after 190+ miles and 65 1/2 hours into the race, I'm sure I would do a face plant if I tried running in the dark, even though these trails are smooth. Runners on the course said they were flying! Like 6 minute miles on the downhills! Well, I'm not sure about that but both runners were able to run under 2 hour loops (Ras 1:55 and Ken 1:57). Only Tim Stroh ran a faster last loop of 1:53. Yes, Ras outkicked Ken by two minutes and took the final podium spot but I just wanted to say that they are both amazing! Ras ran his fastest loop of his entire run and Ken only had two loops that were faster (his first two loops were 1:31 and 1:56). I'm so glad that both were able to repeat the 200, the only ones who have done this. Ras had a 2 hour PR and Ken 4 hours. My Sunday volunteers helped me tremendously as my energy was fading. Allen Skytta manned the middle aid in the middle of the night. Tim Harris, Merita Trohimovich, and Jess Mullen kept the main aid bustling. Merita made pancakes and turkey sausage to order Sunday morning. Stacey Nievweija and her son Keegan took the last shift at the middle aid. That must have been a boring job as there were less runners and they were probably either spread out or came all at once. Mike Schlect came in 3rd male in the 100 with a time of 20:23. Second woman was Kelly Shelton in 22:55 and Hideko Opperman was 3rd female/1st Masters with a 23:08. 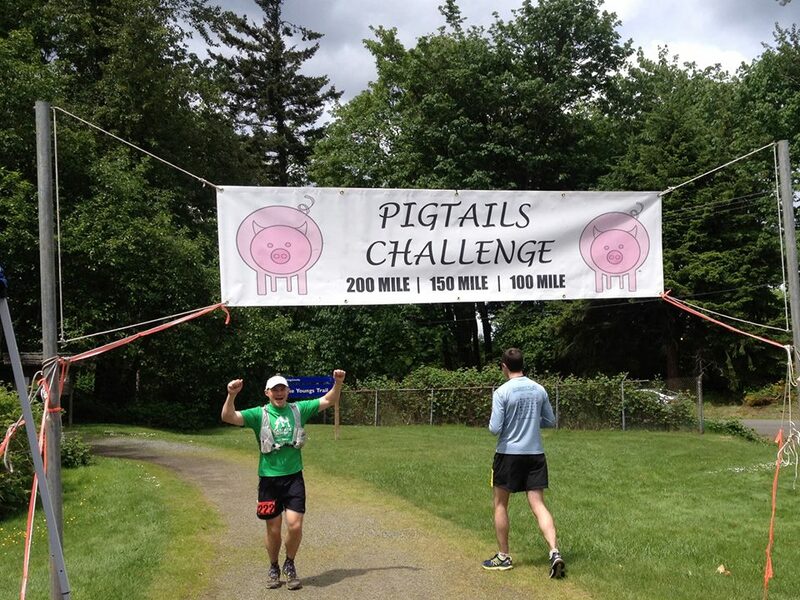 Hideko was told this was her first true 100 but she did complete just over 100 miles at the Pac Rim One Day. This was also a first 100 for Amy and Bob Wismer. Jules Mann came last year to attempt his first 100 here at this race but was unsuccessful. I am so glad he was able to finish this year. He did have to go home and get some sleep but returned and had two strong final loops. Ashley West contributed to the Pigtails buckle bling in the Kuhlmann clan by completing her first 100. Her sister Kim Kuhlmann and father Mike have 100 mile buckles from last year and Daniel got his 200 this year. Daniel finished first overall (54:50) in the 200 milers this year and did very well considering the conditions. Rob Smith ran a consistent and smart 200, finishing 2nd, followed by Ras in 3rd male in 67:27. 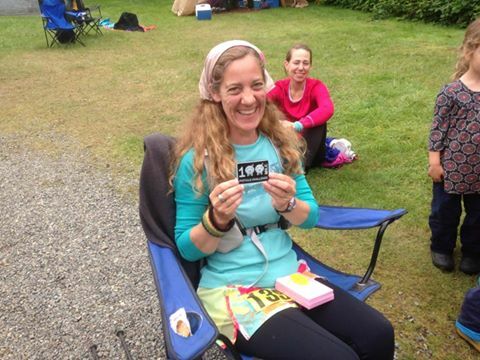 Francesca was the only female 200 mile finisher and 3rd overall in 63:01. 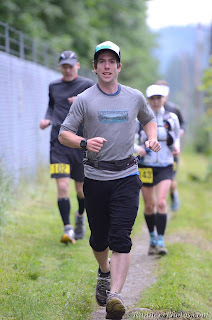 In the 150 mile race, Gavin Woody broke the previous course record by 13 hours with a time of 30:36. He decided to see if he could finish 200 miles and continued on. His unofficial 200 mile time was 45:04, not far off of Tim Stroh's time last year of 43:35. Jonathan Symmes ran his first 100 here last year and came back to run 150. His goal was to be able to finish in time to go see his son run in the state meet, but he missed him by 10 minutes. Still, he had a strong 2nd place finish in the 150 in 32:44. Thomas Jackson was 3rd male with 35:59. Jeri Ginsburg was 3rd overall and first female in the 150 and ran an incredible 35:00. There was not another girl in sight. Kristin Parker was 2nd with 49:15 and Marilyn Olson 3rd in 49:45. Gavin finishing the 150, or is it the 200? Scott Volyn finished his first 100 on his second 100 mile attempt. He is making a difference with "Running to Burundi" by building houses in Burundi for widows and children of the genocide. Linda Walter PR'd this course, improving on her last year's time. John Zeier had a major 100 mile PR of over 2 hours and won a free subscription to TrailRunner Magazine for the best Pigtails. His finish of 22:04 at the 61 is incredible. John, so pretty in Pigtails! Hope Fox ran the 100 as a birthday present for herself. Tammy Unangst was also celebrating her birthday on Sunday but had to stop partway through her 8th loop because of severe pain in her feet from blisters. Sadly, I had to pick her and her pacer up on the course. She has no hills to train on in Texas and the course took its toll on her feet. Chris Bellevie finished his first 100 at his 2 year anniversary of quitting smoking. He decided to change his life and started running. Way to go Chris! Jackie Frederickson PR'd by 2 hours. James Varner had a monkey on his back. 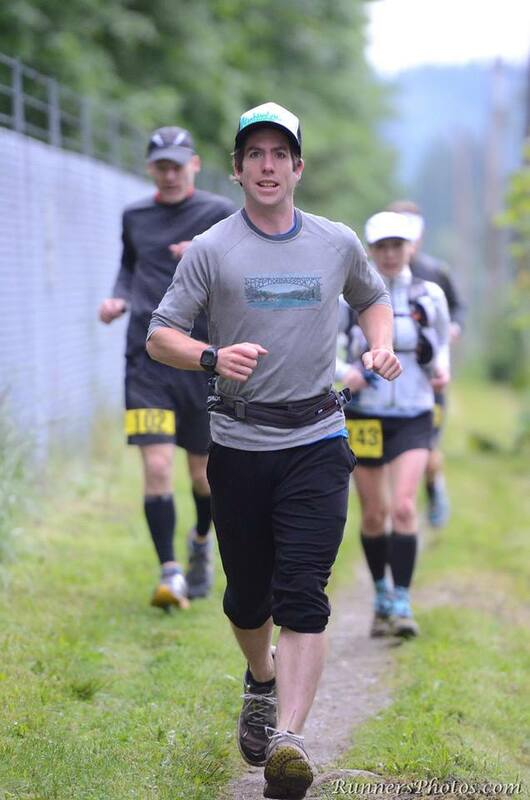 He had not completed any 100 miler that he started in over 5 years. Well, it's hard to finish them when they are runs like Hardrock. But he just wanted to get 'er done. He ran a conservative and smart race. But somewhere past halfway, he ran a loop in the wrong direction. He apologized to everyone on the course for his mistake, concerned that someone would say he was cheating. As soon as he completed the loop, he asked immediately for me and asked if he was disqualified. I told him he was fine. He still ran the same distance and the direction he ran the wrong loop is considered the harder direction anyway. He was so relieved and was able to continue on to finish sub 24 in a time of 21:55. I want to thank Jess Mullen, Betsy Rogers, and Matt Hagen for staying until the end and helping clean the race site/break everything down. Tonya Hoffman, Allen Skytta, and Trey Bailey were also there. Matt went to help Stacy Nievweija and her son Keegan break down the middle aid station. I had locked the canopy to the chain linked fence with a cable lock, but I had the key. I told Matt to just leave it and I would get it later, but he managed to break the lock with Stacey's son watching with great interest. Only Matt. I arrived home at about 3pm on Sunday and finally went to bed. I was awake again this year for 86 hours and got about 1 1/2 hours of sleep. I had intended to wake up to eat dinner but slept through the night. I slept 15 hours and my husband said I didn't even move an inch. I needed that rest to get me through the next 2 days of post race clean up. 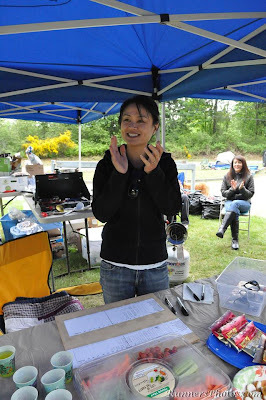 I was more exhausted directing the entire weekend than when I ran it. I also want to thank my brother-in-law Cliff Richards and his wife Mary (my running partner when I was running road marathons) for sweeping the course the next day. I really didn't want to get out there and ride my bike or run to pick up the trash. They said they picked up only a few gel packs but there was a ton of toilet paper on the trail. Gross! I had warned them to bring gloves. So next year, PLEASE, pack your TP out (bring a Ziploc) in addition to trash. When in doubt, pack it out! Thanks and see you all next year! Plan on running or volunteering!